I’ve enjoyed having the breathing space so much that I decided to tackle some additional shelving in my master closet as well. 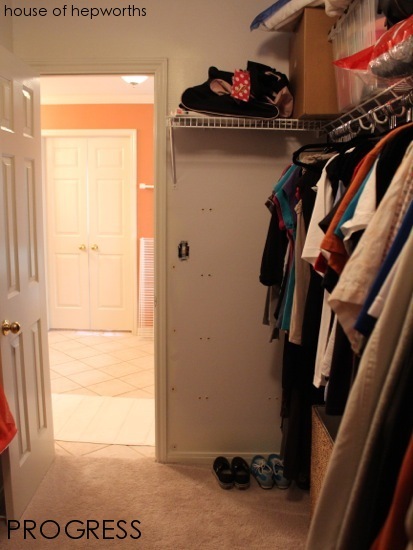 Before we moved in, the closet had shelving up the wall at the entrance to the closet. Not only did it cover the light switch making it hard to turn the light on, it also protruded in such a way that we would scrape our shoulders on it frequently as we entered the narrow doorway to the closet. 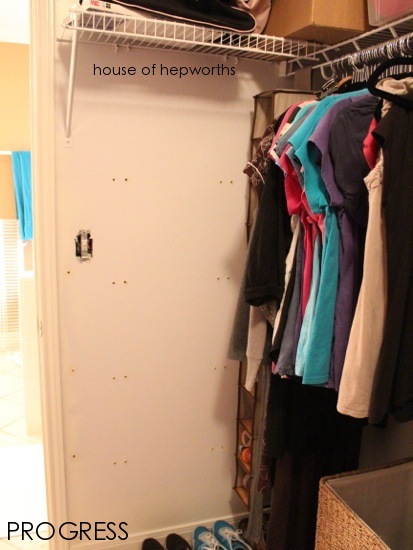 It was nice to have the additional storage, but the shelving made me feel claustrophobic, not to mention the bodily harm caused by scraping my arm against the raw metal corners as I entered or exited the closet in a hurry. I easily and absentmindedly tackled this project while chatting on the phone with a friend. Just as before in the pantry, I removed all the screws, removed the shelving, and then pulled all the anchors out with a pair of pliers. I haven’t quite finished yet though. I still need to putty up all the holes left from the large anchors. We’ve already replaced the water softener shower head and carpet in here plus we painted all the baseboards. I am not a fan of wire shelving, so eventually I plan on removing all the shelving and hopefully install some type of closet organization system. 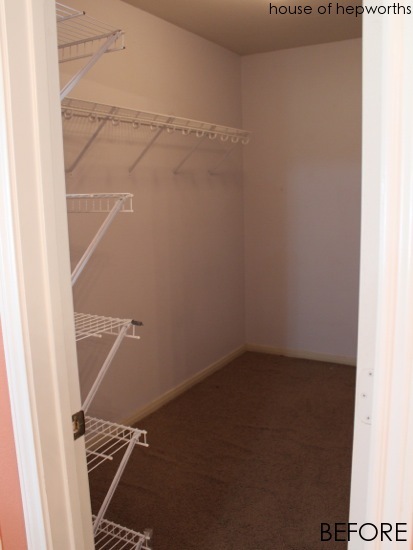 I think this closet could be a lot more organized with some smarter space planning. 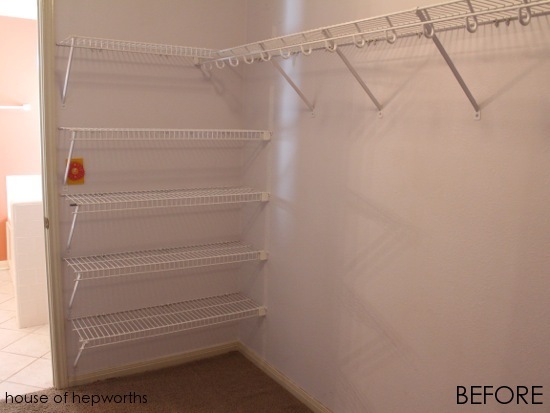 For now though, at least those shelves are gone and we feel like we can move around more freely now. As for the old shelving, I’ve been donating it all to my sister who wanted it for her house, so nothing was sent off to the dump and everything was reused and repurposed. I hope you have a happy Thanksgiving tomorrow and are able to spend the day with your family and loved ones. « Chocolate Bar Toffee. Delicious easy to make treat for the Holiday season. Happy Thanksgiving to you, Allison – and way to think outside of the box! Great post! I really love this. 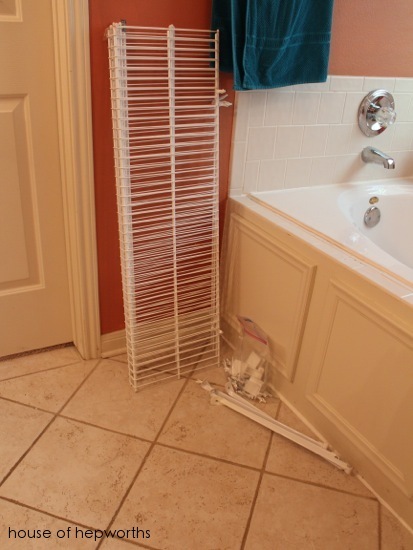 It’s a great space saver and everything looks neat and organized! 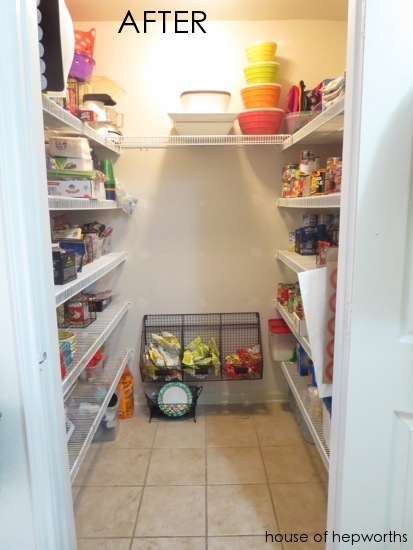 Awesome space saving trick. I really need some wire racks for my home, but don’t know if I’ll have the time this year.